Inspiration is everywhere! Please share tips for how you generate blog posts here, too. This entry was posted in blog content ideas, blog post ideas, blogging, find new ideas for your blog, great blog content, how to find ideas for blog posts, how to generate blog content, ideas for blog content, ideas for blog posts and tagged blog content ideas, blog post ideas, blogging, great blog content, how to find ideas for blog posts, how to generate blog content, ideas for blog posts. Bookmark the permalink. 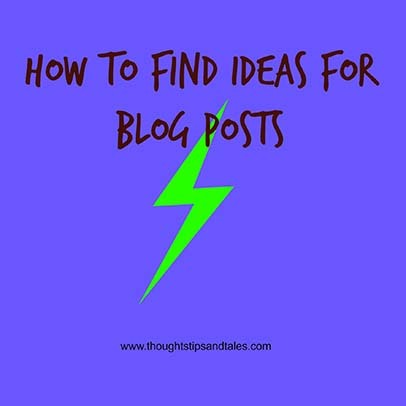 I think all bloggers are struggling to constantly come up with new topics. All good ideas. Thanks for sharing! Thanks for writing. You have GREAT ideas – am constantly amazed with the topics you come up with. Very good ideas. I need to pin this or bookmark it. Sometimes it is hard to combine something and relate it to frugal living and such for blog though. These are all great topics and things to think about for blog posts. Thanks for sharing! I need to use these ideas more. I usually just space out my posts so I don’t feel like I’m running out of things to post, but then there are weeks where I only post once because of it. Thanks for sharing these! Great tips! Sometimes you are surprised by what can inspire you and give you the best ideas! It is hard sometimes, and these are good ideas. I just write as the spirit moves me, or some casual remark someone makes. But I write once a day, so sometimes it does get hard. Lots of great stuff here! I sometimes find myself stuck for post topics, but having an editorial calendar planned for a few months at a time really helps. I’m going to keep this list on hand for the next time I draft one up! Idea are freely floating. we have to cast our nets and hook it. whenever I run out of topics I will remember all your points. I like those ideas. It’s easy to get caught up in the same ol’, same ol’. thanks for these! We gotta take the ideas where we can find them! Love #6. Questions in the comments are a great way to come up with new content ideas! Also, pay attention to your Webmaster Tools and Google Analytics. This will give more content ideas! Good ideas! I only really do photo articles, but often I find I don’t really have a photo topic when it comes time to write it. You have a lot of good ideas here. I often look at old photos to get ideas, especially from traveling. These are great ideas! #6 #16 and #20 are some of my favorites. Thanks for sharing! These are some really great ideas – we’ll be featuring you on this week’s Awesome Life Friday. Thanks so much for sharing! Thanks so much! Glad it’s helpful. This is so helpful. Great ideas..thanks for sharing! Great ideas! If we pay attention to what is going on around us, people watch, etc, we can spark up some new ideas. I like your suggestions because they seem a lot more real/honest than several other lists I’ve seen in the past. If something sounds too much like a writing prompt I have a hard time writing about it authentically, at least for my blog. That said, these are great suggestions and I’m going to pin for later 🙂 Thanks!! Thanks so much – glad they’re helpful!